Former Major League Baseball (MLB) pitcher Kim Sun-woo was released by his Korean club on Monday. 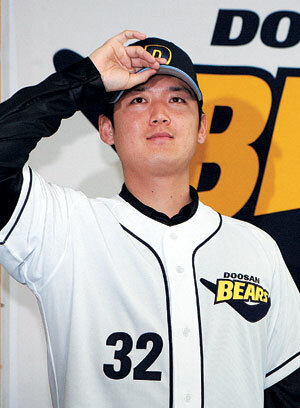 The Doosan Bears announced that they decided not to retain the 36-year-old right-hander for next season. Kim immediately became a free agent but faces a career crossroads after two straight sub-par seasons. He was just 5-6 this year with a 5.52 ERA in 17 appearances, spanning 60 1/3 innings. Last year, Kim went 6-9 with a 4.52 ERA in 163 1/3 innings. Kim joined the Bears in 2008 after spending six seasons in the big leagues with the Boston Red Sox, the Montreal Expos – which later became the Washington Nationals, the Colorado Rockies and the Cincinnati Reds. In his MLB career, Kim was 13-13 in 337 innings in 118 appearances, 38 of them starts. From 2009 to 2011, Kim averaged more than 13 wins a season as the spiritual leader in the Bears’ rotation. In 2011, he was second in the KBO with 16 victories and had a 3.13 ERA.